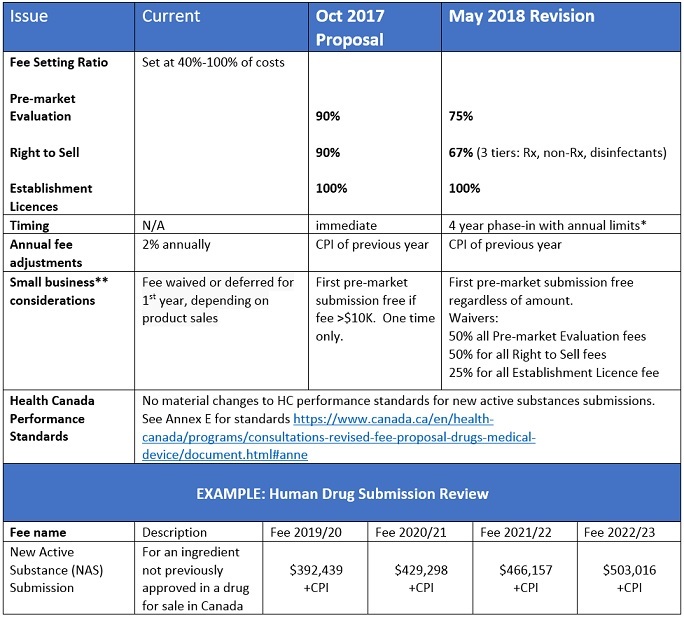 Following the review of more than 100 submissions and 700 comments, Health Canada has considered the divergent views of various sectors to the October 2017 fee proposal and released its revisions. Most notable of the changes is a reduction in the fee for pre-market evaluation from 90% to 75% of costs, with a phased in approach to implementation. Performance standards for Health Canada are mostly unchanged. For further details, including Health Canada’s response/rationale, and the forms for submissions can be found on the Health System and Services section of the Government of Canada, called Revised Fee Proposal for Drugs and Medical Devices. Stakeholder submissions are open until June 14th, 2018.
no Pre-market or Establishment Licence fee increasing by more than 25% in any year, and no Right to Sell fee increasing by more than 50% in any year (excluding Consumer Price Index adjustment). Small Business definition: Any business, including its affiliates, that has fewer than 100 employees or between $30,000 and $5 million in annual gross revenues.